SUiT is a band with Dutch and German members. European integration through rock? It seems the right place to start, as music conquers all borders and convictions. Two members studied at the Rock Academy of Tilburg and two at the Pop Academy of Mannheim. The four members met during an exchange program and started to work together. The Girl, The God, The Rush is SUiT's debut album. A lot of good is to be written on it as you'll find out by reading on. While listening for the first time to SUiT I noticed a lot of similarities with the more serious or better, the less eclectic side of Franz Ferdinand. Suit is able to rock in the same kind of way while keeping the break on the whole time. The dancing without going wild sort of music the Scottish band is also so good at. This was just my first impression as there is so much more going on on The Girl, The God, The Rush. It's the kind of album that takes the listener on a tour across different sorts of music and moods. 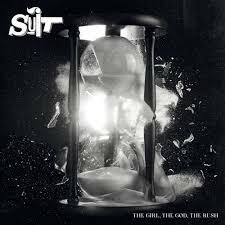 SUiT is a band that mastered several musical styles and genres, without any qualms to play them all for us. Another thing that is noticeable is the how the members of this band master their instruments. There is no hesitation in leaving holes and silences in the songs. This makes the individual instruments stand out. Everything is heard. There are no overdubs or extra instruments. Just guitar(s), bass, drums. When the second guitar comes in for a heavily distorted solo in 'Over The Next Hill', the first clean rhythm guitar drops away. It is not 100% so, true, but in the basis this song is this "clean". SUiT has another boon. It can take the tempo off and remain interesting and so strongly convincing. In part that is in the voice. Alexander Braunbarth has this extremely pleasant rock voice. The vocal melodies are nearly all strong and convincing. The music is resourceful, involving some risks as too empty is often boring and that is what SUiT is not. Even the perhaps weakest song on the album '1Q84' (sorry, I liked the books better) still has its moments and stands its ground. In general SuiT is a two guitar band. Both singer Brautbarth as Ivo Schot play the guitar, with Rutger Martens on bass and Stefan Wandel on drums. Next to writing songs with a lot of empty spaces there are several with the chugging rhythms of desert rock, while the rhythm playing of U2's The Edge clearly has been studied into the fine little details. All these, as such, fine details do lead me to the following comment. In part the songs on this album seem to be the exams leading to the graduation from the respective academies. The influences of the originals are easily divined. (Write them in the comment section if you like.) For a first album that is fine of course. SuiT has clearly put its whole into it and graduated with flying colours. Simply because there is so much to enjoy on The Girl, The God, The Rush. The band dares to show itself and its proficiency by leaving a lot that could have been in here out. This album is a fine blueprint of where SUiT is at in 2018. If the band manages to set the next steps through touring more the follow up ought to be smashing.